The neighbourhood is said to be home to 1,000 artisanal workshops. The artisan’s manual energy is on full display along the streets, where they can be seen carving, sewing, welding, and hammering. The sound of their exertions fills the air. A huge array of crafts are made here – from brass lanterns, colourful textiles, and glassware, to silk carpets and furniture inlaid with mother-of-pearl. The designs are often unique to Cairo and, in some cases, to the district itself. It is an astonishing creative output. Due to recent political instability and a shifting external perception of Egypt, however, the future of many of these crafts is under threat. The number of tourists visiting Egypt halved between 2011 and 2016, while the cost of raw materials such as wood and brass has increased. In the absence of a vibrant market, tourist or otherwise, many of these crafts – some of which are part of traditions going back a thousand years – may not last another generation. The loss of this rich cultural heritage would be significant – the world and Egypt would surely be poorer because of it. 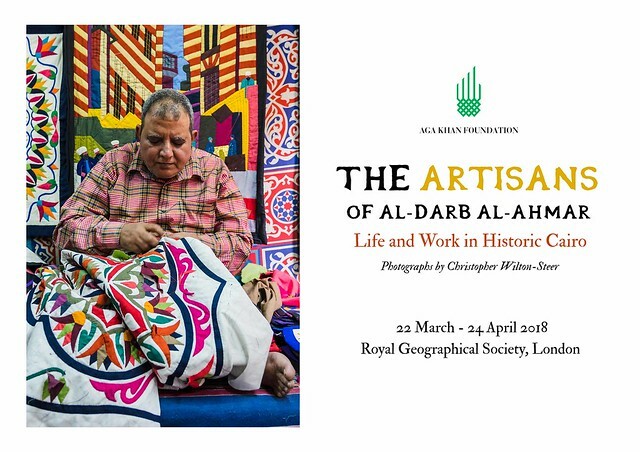 The exhibition – ‘The Artisans of al-Darb al-Ahmar: Life and Work in Historic Cairo’ – ran at London’s Royal Geographical Society between 22 March and 24 April 2018. It is currently being exhibited at Philanthropy House in Brussels until 4 February 2019. Ein Labyrinth aus engen, verwinkelten Gassen, voller mittelalterlicher islamischer Architektur, gesäumt von beeindruckenden Minaretten: Im Viertel al-Darb al-Ahmar in Kairos Altstadt leben rund 100.000 Menschen. Rund tausend davon sind Kunsthandwerker, die in den belebten historischen Straßen ihrer Arbeit nachgehen. Sie bauen Möbel oder Lampen, binden Bücher oder weben Teppiche. The design world has always celebrated individually crafted items, from elaborately woven textiles to hand-thrown ceramics. In a world where mass production is the norm, the talented and dedicated artisans who still work at centuries-old crafts deserve to be celebrated. بين الأزقة الضيقة والشوارع العاجقة.. جذبته أحد الأحياء المصرية، التي قد تكون فقيرة اقتصادياً، ولكنها ثرية تاريخياً. وبدوره، قرر المصور البريطاني، كريستوفر ويلتون-ستير، أن يأخذ الأشخاص برحلة بصرية تروي قصصاً قلَّ سردها عن حي درب الأحمر. Cairo is a historic megacity, home to ancient bazaars, the Great Pyramids of Giza, and one of the world's oldest institutions of higher learning, Al-Azhar University. And tucked in its midst is al-Darb al-Ahmar ('Red Road' in Arabic), a 14th-century quarter that's a maze of narrow, twisting alleyways lined with medieval Islamic architecture and towering minarets. In an era where crafts and arts have lost a personal and unique element in the pursuit of mass production and trends, lays an area in Egypt that still retains a classical approach and the spirit of its history when designing and manufacturing its goods - the criminally overlooked and often ignored Al Darb Al Ahmar district, which is the subject of a sprawling new photography exhibition set to go on show between March 22 and April 24 at London's Royal Geographical Society.